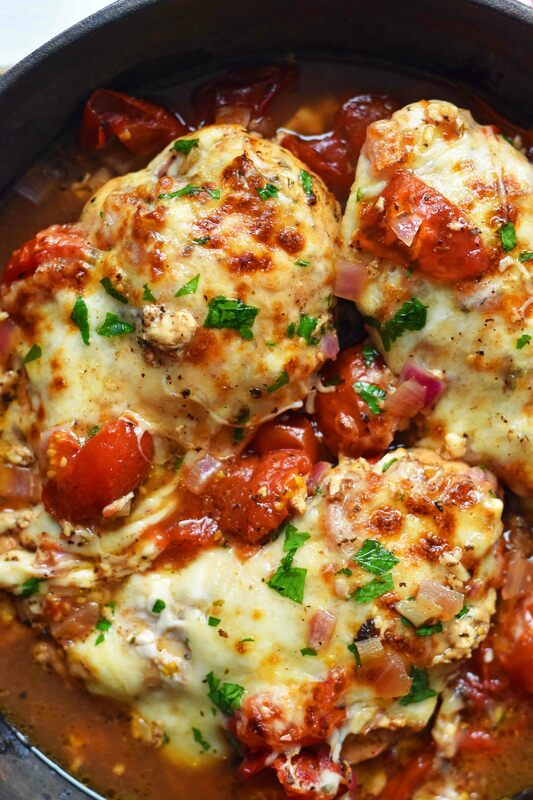 Baked Caprese Chicken with Italian seasoned chicken breast, sweet oven roasted tomatoes, savory balsamic vinegar, and melted mozzarella cheese. 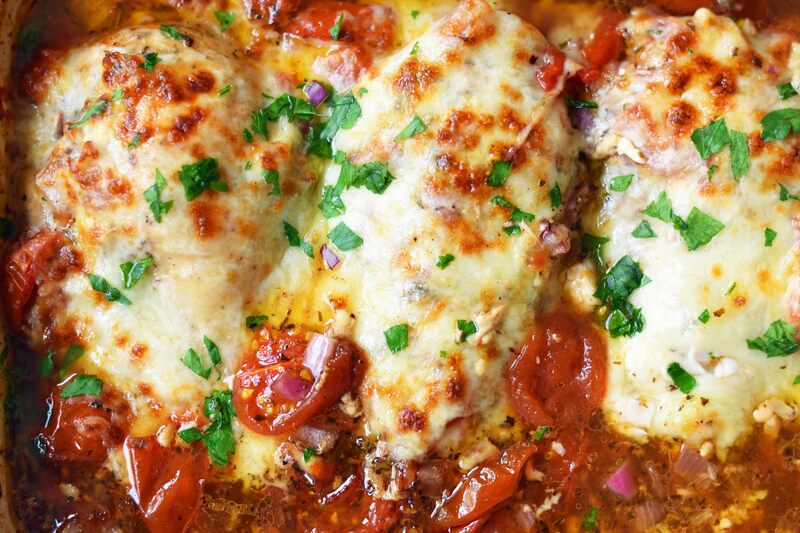 This 30-minute Oven-Baked Chicken with tomatoes and mozzarella cheese will have everyone begging for seconds. This is one of those dinner recipes that is a classic go-to because it is so easy and everyone loves it. It all starts with boneless, skinless chicken breasts. You can use the traditional thick breasts or pick up the thinly sliced chicken breasts. I tend to go for the thinly sliced chicken breasts because the chicken cooks evenly and there’s more topping. It’s all about the topping! Next, to make this Caprese Chicken, you need to season the heck out of the chicken breast. Let’s be real here…chicken is way bland on its own and needs a little help. It is amazing the power of spices to transform bland, boring chicken. We are rubbing on extra virgin olive oil to keep it moist and juicy and a mixture of Italian spices to make it extra flavorful. To bring in the freshness, we are using vine-ripened tomatoes. We all know vegetables taste even better when they are roasted so we are roasting tomatoes with olive oil and balsamic vinegar to make them soft, slightly sweet, and savory. You can use any type of tomatoes but I usually grab the campari or grape tomatoes at the grocery store and halve or quarter them. Bring on the mozzarella cheese! Oh cheese, how I LOVE YOU. After the chicken is baked through, sprinkle on the mozzarella cheese, and broil it for 5 minutes to get it melted and toasty. You can use grated or freshly sliced mozzarella cheese. If you use grated mozzarella cheese, it will melt easier since fresh mozzarella tends to keep its shape for a longer period of time. 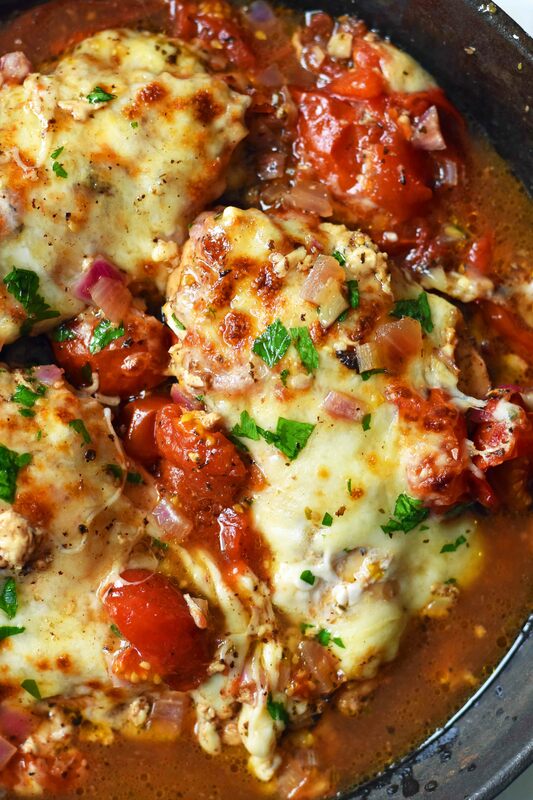 Both are amazing on this Balsamic Chicken with Tomatoes and Mozzarella so it is up to you! Bake at a higher heat to seal in the juices. Bake the chicken just until cooked through, which may be anywhere from 18-23 minutes, depending on the thickness of the breast. Top with mozzarella cheese and place on the top rack to broil for 5 minutes to melt cheese. There’s something so amazing about a cast iron skillet, you can find my favorite for less than $15 bucks HERE. 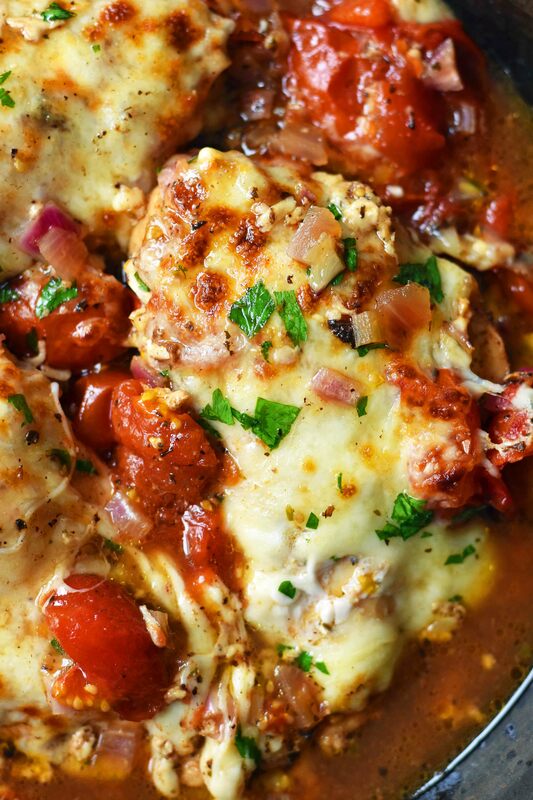 Serve this Baked Caprese Chicken with a side of angel hair pasta or vegetables. 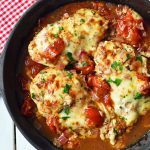 How to make Baked Caprese Chicken? Season, season, and season again chicken breast with olive oil, garlic, and Italian spices. Use Fresh Tomatoes, halved or quartered, with balsamic vinegar. Bake until chicken is cooked through, about 20-22 minutes, depending on the thickness of chicken breast. Remove from oven and sprinkle with mozzarella cheese. Place oven to broil setting and broil for 5 minutes or until cheese is melted and toasty. Serve by drizzling sauce all over chicken. 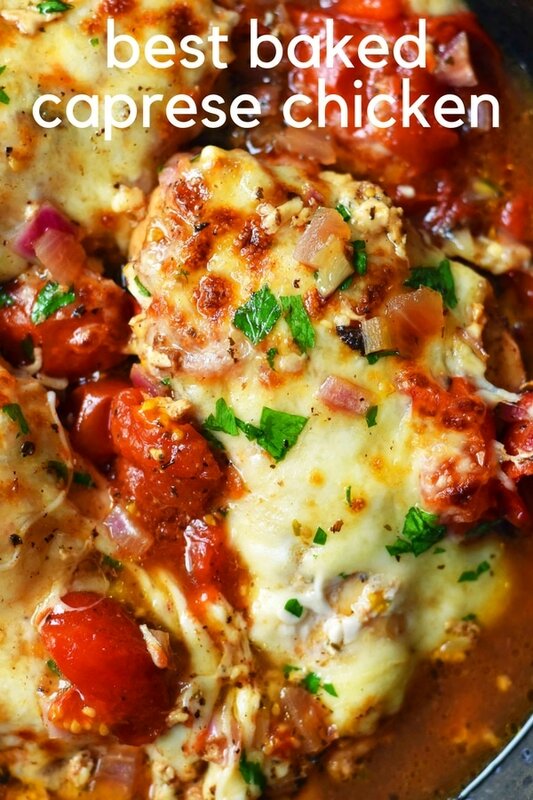 A 30-minute chicken dish full of flavor from sweet balsamic oven-roasted tomatoes and melted mozzarella cheese. Place chicken breast in a baking dish or cast-iron skillet. Sprinkle with olive oil, basil, oregano, garlic powder, salt, and pepper. Place halved tomatoes and diced onion all around chicken. Sprinkle with balsamic vinegar and brown sugar. Bake for 18-24 minutes, depending on the thickness of chicken breast. 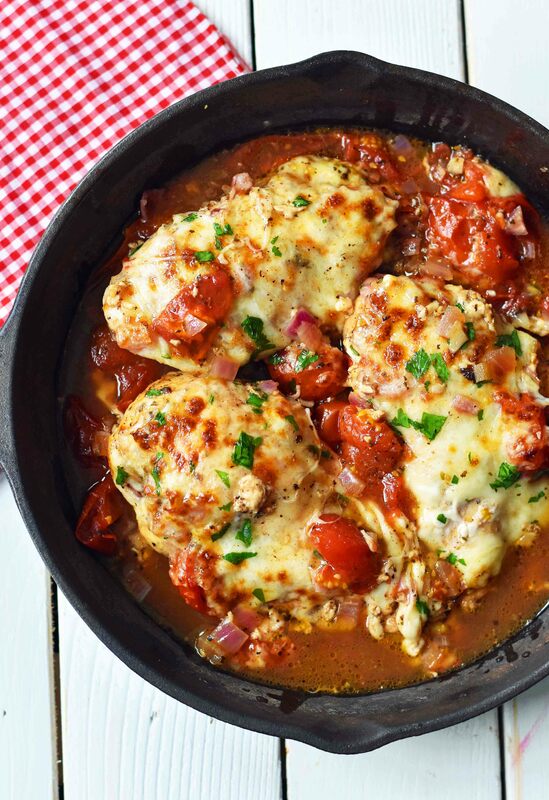 After chicken is cooked through, sprinkle with mozzarella cheese. Set oven to broil and place baking pan or skillet on the top rack. Broil for about 5 minutes, or until cheese is melted. Sprinkle with fresh basil or Italian parsley. 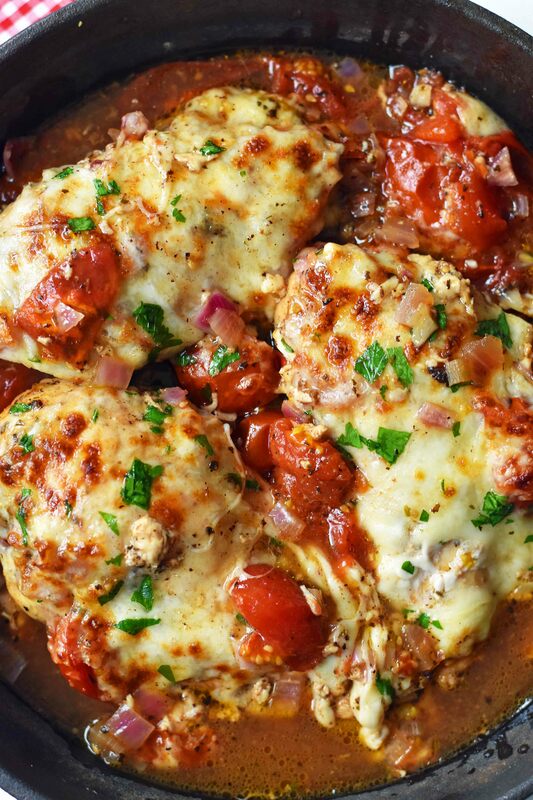 Serve by drizzling balsamic sauce and tomatoes all over chicken. Do you think regular cooking onions would work well? I have everything except the red onions and wanted to cook this tonight! I am a day late and a dollar short in getting back to you. I am sorry! Regular onions will work well in this recipe too. I chose red onions because they are milder in flavor so if you use yellow onions, you can add a bit less if you prefer. I hope you loved it! Thank you for trying my recipe. This recipe is delicious and so easy. Everyone in my family loved it – no complainers at all. Is the nutrition based on 4 or 6 servings? I’m making it now because it looks delicious! Excellent recipe! I made this for a family get together and everyone raves about how delicious it tasted. I am making it again tonight for dinner. Thank you for sharing. This recipe was delicious! I used sliced Roma tomatoes and a fresh basil leaf on top of each chicken breast as well.